For other uses, see Hanabi. 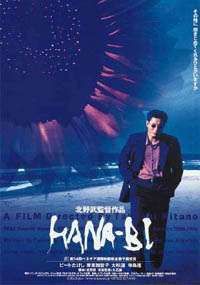 Hana-bi (はなび, HANA-BI), released in the United States as Fireworks, is a 1997 Japanese film written, directed and edited by Takeshi Kitano, who also stars in it. The film's score was composed by Joe Hisaishi in his fourth collaboration with Kitano. Hana-bi (花火, Hanabi) is the Japanese word for "fireworks." The unexpected international success of Hana-bi, coupled with Sonatine's critical acclaim, established Kitano as one of the foremost Japanese filmmakers of his time. Kitano plays Yoshitaka Nishi, a violent police detective who had to retire from the police after a tragic accident during a detention: detective Tanaka is killed by the suspect, while two other detectives, Nakamura and Horiba, were severely injured. Becoming unemployed, Nishi spends most of his time taking care of his sick wife Miyuki (Kayoko Kishimoto), who has leukemia. The film moves at a deliberate pace and devotes much time to exploring their relationship. Miyuki also suffers after the death of their child. To pay for his wife's needs, Nishi borrows money from the yakuza but is having difficulty repaying them. Meanwhile, Horiba, whom the accident left in a wheelchair, experiences a deep depression. His marriage quickly breaks up, so now he lives alone. In a conversation with Nishi, Horiba hints he considered committing suicide, while adding that he would like to paint but cannot afford to buy himself necessary materials. Nishi buys a second-hand taxi cab and repaints it in police colors. He arms himself with a signal revolver and commits an audacious bank robbery dressed as a cop. He gives money to Tanaka's widow and buys inks and papers for Horiba who takes up painting and creates wonderful surrealistic works of art. Nishi then starts a journey to historical sites with his wife; both of them know they will not return. Detective Nakamura learns about the gift for Tanaka's widow, advising her to keep the money. He also learns about the paints for Horiba and soon understands who committed the robbery. Meanwhile, guessing who may be behind the bank robbery, the yakuza thugs chase Nishi to extort money from him, allegedly for storage. Eventually, the yakuza men find Nishi, but he kills them all in a violent shootout. At the same time, Nishi is found by Nakamura, who wants to arrest Nishi for the robbery. Nishi asks Nakamura to spare him a moment of time and sits down on the beach next to his wife, who suddenly says to him, "Thank you... for everything". Then two gunshots are heard behind the scene, so viewers may guess that Nishi shot his wife and then himself. Horibe takes up painting in the pointillist style in order to compensate for his paralysis. In reality, these paintings were painted by Kitano himself, whilst in recovery from an infamous motorcycle accident in August 1994 that left half of his face paralyzed. Kitano's daughter and former singer, Shoko Kitano, makes a cameo appearance playing a nameless girl flying a kite in the film's closing scenes. The film's title is sometimes listed as "Hana-bi", "hana-bi" or "Hanabi" on the covers of international DVD releases and other references to the film in the West. However, the official title is actually HANA-BI, fully capitalized, and is used on all Japanese licensed products, including theatrical posters, video covers and OST covers. The soundtrack CD was first released in 1998 and 1999 by Milan Records, then reissued by Polydor. Although it was not a big success financially, Hana-bi received critical acclaim and won the Golden Lion award at the 54th Venice International Film Festival and numerous other accolades. Kitano himself said it was not until he won the Golden Lion that he was accepted as a serious director in his native Japan; prior his films were looked at as just the hobby of a famous comedian. It also won the Grand Prix of the Belgian Syndicate of Cinema Critics. Review aggregator Rotten Tomatoes reports that 95% of 19 professional critics have given the film a positive review, with a rating average of 8.3 out of 10. American film critic Roger Ebert rated it three stars out of four, citing its unusual approach toward serenity and brutality, calling it "a Charles Bronson Death Wish movie so drained of story, cliché, convention and plot that nothing is left, except pure form and impulse." Jaime N. Christley of Slant Magazine gave the film a perfect four star rating. 1 2 Ebert, Roger (March 20, 1998). "Fireworks". Chicago Sun-Times. Retrieved 2009-07-30. ↑ "A Gallery". Fireworks (DVD). New Yorker Films. 1998. ↑ "Midnight Eye interview: Takeshi Kitano". midnighteye.com. 2003-11-05. Retrieved 2015-12-26. ↑ "Takeshi Kitano Interview". The A.V. Club. 2004-08-11. Retrieved 2015-12-26. ↑ "Fireworks (Hana-bi) (1997)". Rotten Tomatoes. Flixster. Retrieved 2015-12-26. ↑ "Fireworks". Slant Magazine. 2004-07-07. Retrieved 2015-12-26.